Annette Kellerman performed in a glass tank and attracted national attention at the New York Hippodrome as the first underwater ballerina. Katherine Curtis starts a water ballet club at the University of Chicago. The group executes strokes and floating formations. Sixty of Curtis' swimmers, the Modern Mermaids, performed in the lagoon at the Century of Progress World's Fair in Chicago. Esther Williams popularizes water ballet with her performances in the San Francisco Worlds Fair Aquacade and MGM movies. FINA, the international aquatics federation, is formed. FINA makes synchronized swimming a competitive division of aquatics. 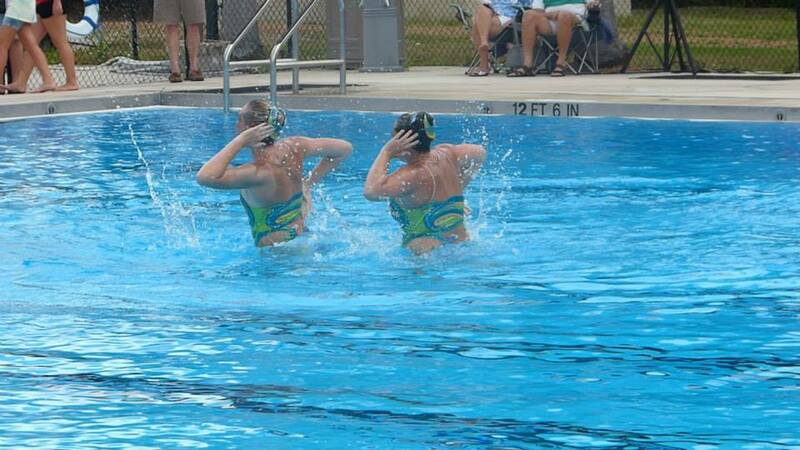 Synchronized swimmers from Athens Club of Oakland California, demonstrate at the Olympics in Melbourne, Australia. Synchronized swimming premieres at the XXIII Olympics in Los Angeles. Tracie Ruiz and Candy Costie win the first Olympic medals in the duet event. Ruiz captures a gold medal in the solo event. At the XXV Olympiad in Barcelona, Spain, the U.S. team sweeps gold medals in both the solo and duet events. Kristen Babb-Sprague is crowned solo champion. Karen and Sarah Josephson dominate the duet competition to win their first-ever Olympic gold medals. In the team event's premier at the 1996 Olympic Games, the USA performs flawlessly. After winning the technical routine portion, the USA's free routine "Fantasia on an Orchestra" captivates the audience and judges. The USA receives a perfect score of 100 in the free routine to earn the first Olympic gold medal in team competition. In synchronized swimming we have many wardrobe changes. For figure competition, when you show off one skill in front of a panel of judges, we wear black suits and white caps. For the routine competition, when you perform your choreographed routine to music, you wear special suits designed and ordered by the coaches to compliment each routine, that get more elaborate as you move up the levels. For routines the hair is also pulled into a bun and "knoxed" with a headpiece to match the suit. You'll learn more about knoxing when it comes time for competitions. At competitions the athletes all wear a matching uniform of a team shirt, blue shorts and pink flip flops. Matching pants, jackets, parkas, bags and towels are also available, but not required. At TBS we have several coaches that compete at the masters level. Masters consists of both former amateur and professional athletes, as well as newcomers to the sport from the 20-29 age group all the way up to the 80+ age group. We compete under the umbrella of Team Florida with our friends and teammates from all over the state. If you're over the age of 20 and interested in synchro we would be thrilled to have you practice with the SynchRays and compete with Team Florida!